The Lab is equipped with 5 field spectroradiometers (GER1500, SVC HR-1024, ASD hand-held 2) with coverage from 350nm up to 2500 nm, white spectralon panels, fire optic probes & diffuser, underwater enclosure for GER 1500 spectroradiometer, open sky integrating cosine receptor sphere, leaf reflctance probe system, integrating calibration sphere, HgAR & Krypton spectral calibration lamps, software for processing spectroradiometric data. All the equipment is suitable to collect ground truth spectroradiometric data over different targets such as rocks, soils, water bodies and vegetation. The Lab is capable of performing instrument calibration and testing. Applications include environmental monitoring and assessment, agriculture, water quality, geology, forestry, industrial, defense and intelligence, etc. Meteorological Stations Various meteorological stations, located in different. A 3 meter diameter low altitude helium balloon remote sensing system with spectroradiometer and multispectral camera. The UAV systems can be used for a wide range of remote sensing applications, including agriculture, land survey with up to 2 cm resolution, archaeology, cultural heritage, cadastral surveys, high altitude surveys, forestry, land management, aerial photography, photogrammetry, surveillance, etc. 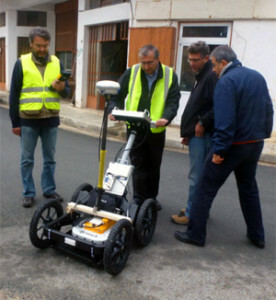 Ground penetrating radar systems can detect changes in the geometry of subsurface interfaces, which is useful in surveying below ground. The MALA ProEx System offers a versatile, real-time full range ground penetrating radar system with ground penetration up to 10 meters. Applications include archaeology, cultural heritage, utility lines and other buried objects. The RS Lab is equipped with various stateof-the-art GPS systems that are able to receive both GPS and GLONASS signals and are used for surveying, mapping and stakeouts. With this technology, accurate signal tracking can be performed and RTK measurements can be verifid to ensure reliable results with high accuracy. The Leica ScanStation C10 laser scanner may scan up to 50,000 points per second, while the accuracy up to ±6mm/50m distance. The field of view of the Scan Station is 360o x 270o. The instrument may be used for documentation purposes of Cultural Heritage sites and monuments as well for documentation of buildings and structures.